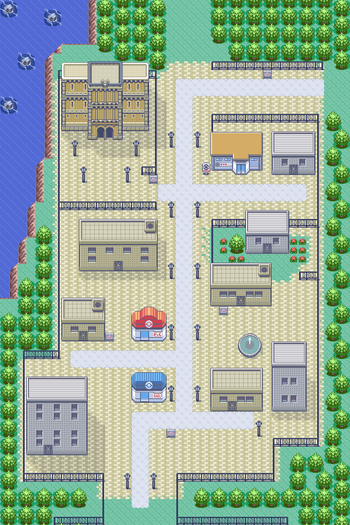 Rustboro City is a big city. Many of the people who live here work for the Devon Corporation, whose headquarters is in this city as well. Just as you enter Rustboro City from Route 104, you will see a gap in the fence to the east, where the fence does not reach the tree line. If you go through this gap and follow the path between the fence and the trees, you will find an X Defend. Just to the west as you enter Rustboro City is an apartment building where Devon Corporation employees live. On the second floor, talk to the little boy to get a Premier Ball. Finally, if you go to the Pokémon Trainer's School (located to the northeast of the Pokémon Center), you can talk to the teacher to get the Quick Claw. To the west of the Pokémon Center is the Cutter's house. Talk to the man inside to get HM01 (Cut). Cut is not a powerful attack, but it will help you cut down trees. However, you can't use it outside of battle until you get the Stone Badge. If you talk to the girl living in the house next to the Rustboro City Gym, she will offer to trade Pokémon with you. The Pokémon she asks for, and the one she gives you, depends on the version you are playing. In Ruby and Sapphire, she will ask for a Slakoth in exchange for a Makuhita. Note that you can get a Slakoth in the Petalburg Woods if desired. In Emerald she will offer you a Seedot for your Ralts. Unfortunately, this isn't a very good trade, considering how rare Ralts are. Be sure to buy some potions, because the gym is full of strong trainers. X Defend can also be quite useful, as it increases your defense (1 Battle). This gym is based on Rock-type Pokémon, so any Grass-, Water-, Fight-, Steel- or Ground-type Pokémon will do. If you chose Treecko or Mudkip will not have difficulties, but if you have Torchic, will have some difficulty. A good strategy is to evolve your Torchic to Combusken which when evolves, learns Double Kick, an attack that is the fighting type. You can also catch a Marill or Shroomish, as they will be very useful. 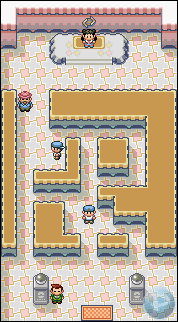 The Layout in Ruby and Sapphire. Note: Depending how you interact with Tommy and Marc, you can fight both of them at once in a Double Battle. To do this, you come directly in the line of sight of both of them at once. The easiest way to do this is to come straight up the left side of the maze. Once you beat Roxanne, you'll get your first badge, TM39 (Rock Tomb) and the ability to use HM01 (Cut) outside the battle. Now that you have your first badge, step outside, where you'll see the same Magma or Aqua grunt that you fought in the forest running away from the Devon Corporation building, with the worker you saw earlier running after him. You can head over to the Pokémon Center and heal if you want. When you head north, you'll meet the worker, who will give you a job to do: pursue the Aqua/Magma Grunt and retrieve the Devon Goods he stole! 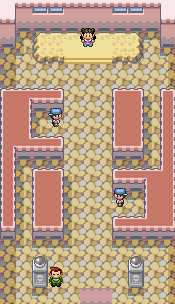 Start by chasing the grunt through Route 116. Emerald Players have the privilege of fighting their rival near the Poké Mart after they complete their errand. This battle isn't mandatory, since he/she will ask you if you want to fight him/her. This page was last edited on 26 November 2018, at 00:28. This page has been accessed 239,098 times.